If you are alive and awake, you have stress. If you deal with the public, you are meeting with stressed out people every day. Have you noticed they get cranky? Dianne Morr’s “Ice the Burnout” program takes a look at the situations and conflicting demands that bring stress into everyone’s daily lives. * Rocky economic climate? Check! * Increased demands to be more productive at work? Check! * Loved ones you want to nurture and support? Check! * Time for yourself? What?! Dianne has faced them all. With warmth, understanding, and gentle humor, she can show you the way to subtract some stress and add some happiness to achieve more balance in your life. Sharing her own stories she teaches healthy, practical steps to start enjoying life in the now. 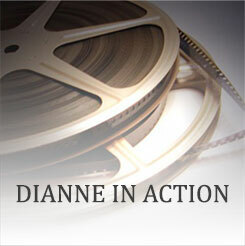 Dianne’s “Ice the Burnout” program provides a new twist on combating stress before it turns into burnout. Based on techniques scientifically proven to reduce stress and increase happiness, this presentation includes easy practices you will want to add to your daily life. Her interactive program reinforces your resiliency, helps identify your most effective stress busters, and emphasizes the importance of self-care to increase satisfaction in your work and your life. Don’t miss this chance to learn how to claim the happiness you deserve and share it with the important people in your life.